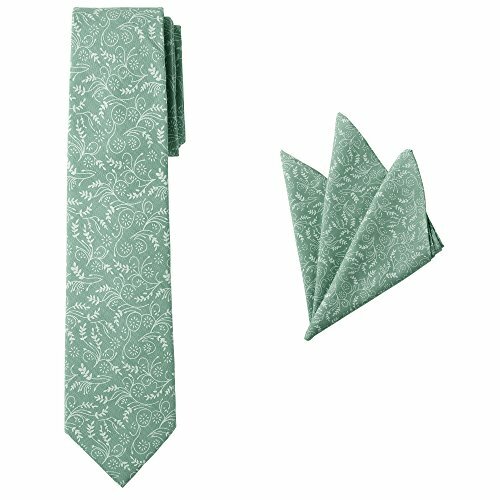 A matching set consisting of a men's floral neck tie with a matching pocket square. Floral set of tie and hanky are made of 100% cotton. Perfect for all occasions including weddings, parties, and special events. Neck ties are standard 63 inches length. Regular tie has a width of 3.25 inches, and the Slim neck tie has a slightly more narrow width of 2.75 inches. This set is part of the trademarked Jacob Alexander collection of men's and boy's neckwear and accessories. Jacob Alexander sells an array of cuts and sizes, the collection is known for its quality and attention to detail. Color matching is done carefully so that we are able to match up all components of the collection. Neck ties, bow ties, suspenders, cufflinks, pocket squares, and other men's accessories available by this reputable brand.